Suave and gracious with a sense of je ne sais quoi, Tunku Naquiyuddin Tuanku Ja’afar is a consummate businessman. I had the privilege of meeting this member of the Negeri Sembilan royal family recently. His entrepreneurial drive has seen him invest in numerous ventures. His family was the founder of Antah Group. Tunku Naquiyuddin is the director of Syarikat Pesaka Antah Sdn Bhd, the investment holding company of the Antah Group, which was incorporated on July 30, 1974. The company was named after Tuanku Antah, Tunku Naquiyuddin’s great-great-grandfather and the sixth Yang di-Pertuan Besar of Negeri Sembilan from 1872 to 1888. Interestingly, Tuanku Antah had left an indelible impression on the British by opposing their decision to appoint an adviser to the state. This led to the Battle of Bukit Putus, which saw Tuanku Antah defeated and he was sent into exile for a year. But the winds of change came and his fortunes soon turned around. “[Tuanku Antah] was brought to see the British governor-general in Singapore. If you read the despatches in the archives in London, you will come across a letter saying that we need to keep this person as the ruler of Negeri Sembilan so that he can help unite the state,” says Tunku Naquiyuddin. He recalls that even at a young age, he always had an entrepreneurial streak in him. After studying international politics and subsequently entering the Foreign Service, he was sent to Paris. But before setting foot in the City of Love, Tunku Naquiyuddin set up the first French restaurant in Kuala Lumpur in 1972. His sister helped him run the restaurant. “For me, it was an investment. The entrepreneurial spirit was always there,” he smiles. After being stationed in Paris for three years, he returned home to be an entrepreneur. “When the New Economic Policy started, Tun Abdul Razak called my father to get the royal families to encourage the Malays. Many did not have the wherewithal [to go into business], so the best way was to seek the help of a few rulers. That’s when we formed the Antah Group,” says Tunku Naquiyuddin. Today, it is a conglomerate with interests in power generation, property development, IT and telecommunications, financial services, education, trading and retail, plantations, aquaculture, mining, leisure, entertainment and lifestyle, healthcare, wellness and healthy living. Tunku Naquiyuddin also serves on the board of other public-listed companies such as Kian Joo Can Factory Bhd and Noble Mineral Resources Ltd in Australia. With his many business interests, he is also passionate about environmental matters. In 1992, he was invited to join the Business Council for Sustainable Development. He co-authored a book entitled Changing Course: A Global Business Perspective on Development and the Environment, which highlights how businesses can make money and how with that money they can do things for the environment. “At the time, I was also a member of the World Wildlife Fund (now known as World Wide Fund For Nature). So, combining the two, I became a greenie,” he says with a chuckle. One of the “environment” businesses he has a stake in is EntoGenex Industries Sdn Bhd, which uses biotechnology to tackle the mosquito problem to reduce the spread of dengue and malaria. According to Tunku Naquiyuddin, the technology can also be used to deal with other insects and even lizards. Little did he know that this venture would help him in his latest property project. Situated in Jalan Desa Budiman in Sungai Long, Kajang, is an 8.6-acre tract of freehold Malay reserve land earmarked for a high-rise project called Nadi Aman. “Nadi means ‘pulse’ and Aman means ‘peace’ in the Malay language,” says Tunku Naquiyuddin. “The land is at the outer edge of Bandar Sungai Long and part of Bandar Mahkota. These two townships are quite mature with landed housing schemes and low-rise, low-density developments. “Sungai Long is, to some extent, a university town, and a lot of people have built structures for university students ... basic ones. I felt why should people, because the prices of units are below a certain level, have to make something so basic and live in boxes. So, I discussed with the architect and quantity surveyor and we came up with Nadi Aman. “Nadi Aman will be overlooking the existing housing schemes with unobstructed views. One side will offer views of Bandar Mahkota and on the other side, views of the forest and the new highway (East Klang Valley Expressway). He says the land was purchased many years ago and had an existing stream running through it. Nadi Aman will be developed by HN Ventures Sdn Bhd, a member of Antah Group. The development will occupy 4.8 acres, with the remaining 3.8 acres — which is sloping and covered with verdant greenery — to be left untouched and preserved as a forest for the residents to enjoy. “We started with a land parcel that many people probably wouldn’t want to develop. No doubt it is quite a sizeable parcel, but it has a stream that runs diagonally across it. So, we have to work with extra care to ensure that we don’t disturb the environment [too much],” says Tunku Naquiyuddin. The estimated gross development value of the project is RM231 million and the launch is slated for the middle of the year. Nadi Aman’s target market is young professionals and dual-income families. There will be three towers — 23 storeys (with 217 units), 32 storeys (121 units) and 39 storeys (270 units) — and the typical units will come with three layouts of 1,000 sq ft, 1,200 sq ft and 2,066 sq ft. The indicative selling price starts at RM382,000. The top levels will feature duplex units. The maintenance fee has yet to be determined. The north-south orientation of the buildings will reduce heat gain and the glare of the sun. “Every unit will be a corner unit. Originally, we wanted to have two duplexes, but people who came to register their interest in the project were interested in such units,” Tunku Naquiyuddin says. As a result, he says, they may include up to 14 duplexes in the final design. He also adds that there will be eight garden units to give variety to the development. The three towers will be adjoined at the podium and the stream will flow between the blocks. “Some units will face each other although we have varied the heights of the buildings. For such units, we give them a nice view of the stream below,” says Tunku Naquiyuddin. “One of the challenges is preserving the stream. So, we designed Nadi Aman in such a way that the stream runs between two towers. We will also beautify its banks. Sitting areas and bridges will be built to encourage the residents to mingle while their children play in the shallow water. Other facilities in the development will include a gym, outdoor lounge, barbecue area, playground, surau, multipurpose hall and three pools — an infinity pool, a children’s pool and a pool for women and their children. 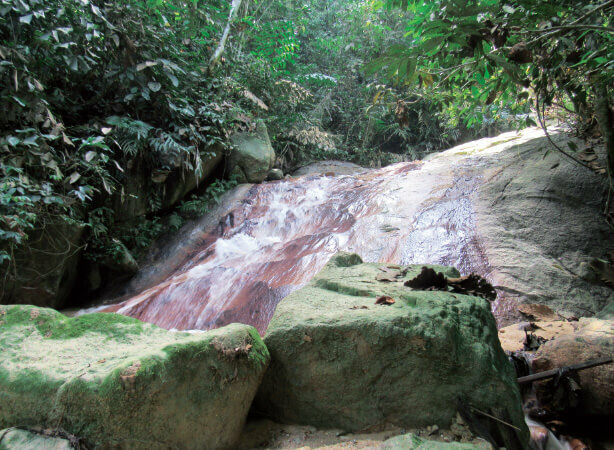 Outdoors, there will be a 1.5-km trail that leads into a jungle with five waterfalls. There will also be fitness stations and gazebos along the trail as well as a barbecue and picnic area. Rainwater harvesting systems and solar panels will be installed, says Tunku Naquiyuddin. Pests aside, in view of the soft property market, why launch a project now? He says the company has recently signed environment specialist construction company — Cypark Resources Bhd — as contractor, which he believes will benefit the development. Currently, the transacted values for properties in the area for terraced houses range from RM700,000 to RM800,000; detached houses, from RM2 million to RM3 million; and townhouses, from RM250,000 and RM300,000. The average yield is 2.5% to 3.5% per annum. While there are no high-rises in the immediate vicinity, Toh highlights there are some a short distance away. These include Forest Green Condominium with unit built-up from 958 sq ft to 1,001 sq ft, selling for RM378psf with yields of 3% to 3.5%; Greenview Residence have units from 1,356 sq ft going for RM320 psf with yields of 3.8% to 4% and Green Acre Condo with units from 1,012 sq ft selling for RM360 psf with yields of 3.8% to 4%. 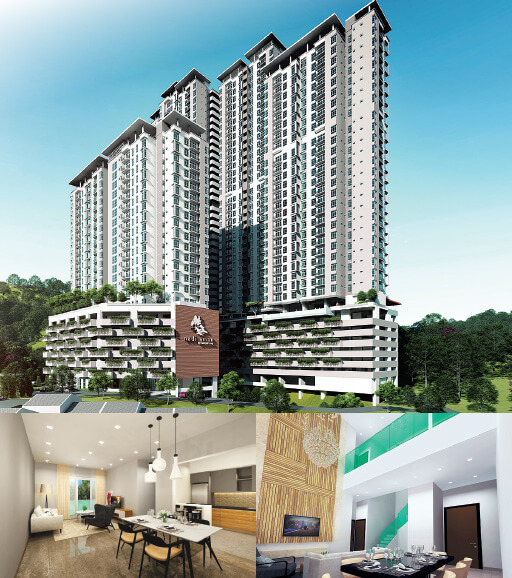 There are also the Evergreen Park high-rises, with Acorn & Hazel units of 1,141 sq ft to 1,184 sq ft selling for RM300 psf with yields of 3.5% to 3.8%; Scot Pine units of 1,600 sq ft to 1,800 sq ft going for RM410 psf with yields of 3.5% to 3.8% and Cypress units of 1,400 sq ft to 1,500 sq ft going for RM430 psf with yields of 3.5% to 3.8%. Toh says the outlook for the area is positive. “More developments will be coming up in the northeastern flank of Desa Budiman. The catalyst is the East Klang Valley Expressway, which connects Desa Budiman to Cheras Vista, all the way up to Taman Bukit Ampang. While Nadi Aman is awaiting its development order, the company looking to develop another land parcel in Seremban. “That will probably be the next high-rise project I will do. Right now, I am looking at concepts for four acres of land, and the parcel is located next to a successful Sime Darby development,” Tunku Naquiyuddin says. “[When it is up,] we will be the only high-rise development there. But the challenge in Seremban is, not many people like to live in high-rises. But if we give some nice features, can we get more locals to live in high-rises? That’s the challenge.